Content: 70% Jerusalem artichoke (topinambour) and 30% natural apple juice. 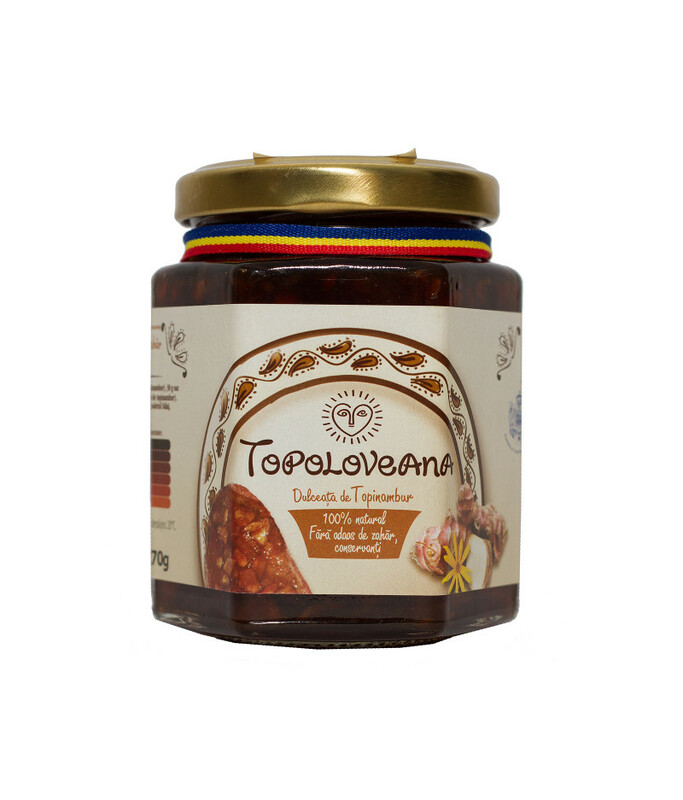 Topoloveni Jerusalem artichoke(Topinambour) Gourmet Confiture–230 g.
Nutritional qualities: The Jerusalem artichoke (Topinambour) Gourmet Confiture has a medium energetic value (289 kcal/100 g) and a content of food fibers of 7,7%. “The product contains a large quantity of food fibers, both soluble (10,1%) and insoluble (7,7%). The soluble fiber is represented especially by inulin, that is considered to be a functional food ingredient because it can modify the physiological and biochemical processes inside the human body. It prevents the appearance of some diseases and it conducts to an improved health state. The inulin has the role of a bifidogenetic agent, which stimulates the immune system. It also decreases the level of pathogenic bacteria from the intestine, combats constipation, lowers the risk of osteoporosis by increasing the absorbtion of minerals (especially calcium), reduces the sugar absorbtion in the blood, preventing the metabolic syndrome and diabetes.